Kurt Guelsdorf is out as girls' basketball coach at Oregon City High School. Guelsdorf, who led the Pioneers to state championships in 2004, 2009 and 2014, met with Oregon City principal Tom Lovell and athletic director Andy Jones on Wednesday and was told that they wanted to make a coaching change. "The administration and I didn't see eye to eye on some things and they felt like, in their words, 'they wanted to move in a different direction,'" Guelsdorf said. "I'm sad, but I also know that I'm very proud of what I did, I'm proud of our kids, and I'm so lucky to have been there for 15 years. "We won a lot of league titles, we had a lot of kids that went on and played in college, and there were a lot of great relationships that I was able to build in our community. I'm going to miss that, obviously." Guelsdorf, who ranks eighth in career wins among Oregon girls' basketball coaches with a record of 451-123 over 21 seasons, said the reason he was dismissed came down to "a difference in opinion with how some things were done." "I stand by my record and I stand by how I did in my job," he said. "I know that there are certain things that athletic directors might look at that they might disagree with, and if they want to go a different direction, that's what they do. "As high school coaches, we're all on these one-year deals and we know that the administration is going to decided what they want to decide. If they don't think that you're the right person in their opinion moving forward, they can go any direction." Jones declined to comment on the decision but wrote in an email: "The girls' program will be going in a different direction. We want to thank Coach Guelsdorf for his 12 [sic] years of dedication and service to the program." Guelsdorf started his coaching career at Gresham where he went 96-59 in six seasons, leading the Gophers to five playoff appearances from 1998 to 2002. In 2003, he moved to Oregon City to become co-head coach with Brad Smith, joining one of the state's most-decorated girls' sports programs. Over the past 15 seasons, the Pioneers posted a record of 355-64 -- an impeccable .847 winning percentage -- and in addition to their three state championships during that stretch, they also made three other state finals appearances in 2006, 2008 and 2017. This past season, Guelsdorf guided the Pioneers (17-9) to their third Mt. Hood Conference championship in four seasons with a lineup that featured junior guard Brooke Bullock and his two senior twin daughters, Kaari and Kylie. 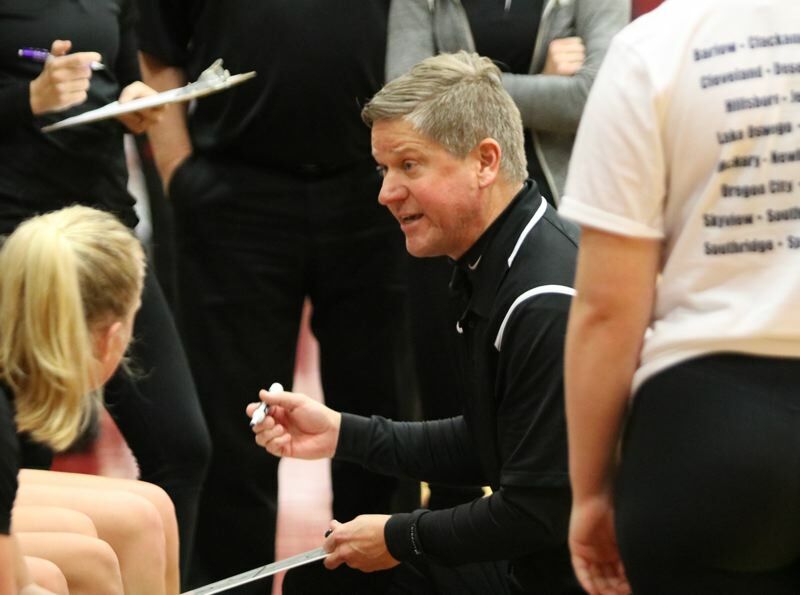 Clackamas Community College women's basketball coach Jim Martineau, whose daughter, Mia, saw spot duty on Oregon City's varsity team as a freshman this winter, was disheartened when he heard that Guelsdorf and the Pioneers had parted ways. "I'm sad for my daughter that Kurt's done," Martineau said. "My daughter loved playing for him and as parents, we enjoyed having him coach our daughter. He has a brilliant basketball mind and that's going to be missed." Former Oregon City standout N'Dea Flye, a freshman at the University of New Mexico, went to Twitter to express her disappointment with Wednesday's decision. She wrote: "My heart is hurting all the way from New Mexico when I heard about Oregon City losing an amazing coach. No one will ever have a coach that fought for a player to stay on a team how I did. Best high school coach in Oregon. It's sad that no one will be able to experience his coaching now and how hard-working he is. Having a coach waking up at 5 a.m. every morning to get shots up with you before school/games or even helping you with your homework 'cause you're slacking in that class is something special and you guys will never find someone like that. They can never take away the banners/trophies you earned. You'll always be my coach KG." Guelsdorf had talked about coaching at least another four years at Oregon City so that he could work with his youngest daughter, Kaydyn, who will be a high school freshman next fall. Now, his plan is to continue in his position as a math teacher and assistant golf coach at Oregon City and start looking into other opportunities to coach basketball. "I think I'll let the emotions get out of it and let the dust settle," he said. "I've had some good friends in the basketball world contact me and there are things that I could do this spring to test out a little bit. "I think I'm recognized as a quality basketball coach with a pretty good mind for the game and a pretty good feel for helping kids get better, so we'll see what I do. I might dabble here and there, or I might just play a lot of golf."